One of the finishing touches on the exterior of our house on Lansing Street in Madison is the trim band above the windows and doors. Completing it has languished a bit, because it's taken some time to research and craft the concept: to carve words into the trim material, the word "peace" in many different languages. 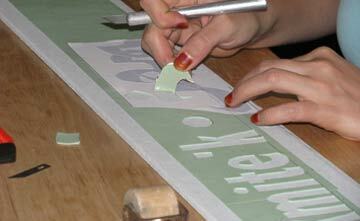 The project started with finding the written word "peace" in many languages. We began asking around of friends and colleagues, waiters in foreign-cuisine restaurants and the like. But we quickly shelved as impractical the notion of personally contacting all native speakers. So we turned to a comparision of internet sources. Wikipedia states that there are between 5,000 and 10,000 languages in the world. Obviously the available perimeter of house limited the number of languages we could include. Some words for "Peace" are very short -- the Tarawan (Micronesia) Rô , or the Navajo K'é -- but others are astonishingly long -- the Armenian Խաղաղություն and the Nahuatl (Aztec) Tlamatcanemiliztli. Averaged out and rendered at a readible scale, we calculated that our available space on the band would limit us to about 100 words. A few could be combined. For example, a half-dozen languages each share the words Mir and Pace. (Although they don't all write the word in the same way; Russians and others write mir as Мир.) At best we would be including only a fraction of the world's languages -- those with millions of speakers but also some from the more obscure groups. Never mind the possibility of different translations of the concept (Do we mean "inner peace"? Or rather civic harmony? Or merely absense of active war? Etc...), the sheer number and variety of words is bewildering. Unlike the typical U.S.citizen, many people worldwide speak multiple languges, and there abound many close variants of superficaially similar words. Other difficulties became apparent. The internet and indeed computer software in general does not yet have a comprehensive format for accurately rendering text in all of the many scripts used worldwide. If you are having difficulty reading some of the text on this page, you have a sense of the problem. When we could, we attempted to confirm the correct appearance of a word in text by also finding a pictoral representation somewhere. This proved difficult for many languages however. The narrow horizontal format of the project meant that the layout would place limits on ascending and decending letter-parts. Each word would need to be composed separately and carefully to fit but still be legible. For unfamiliar word-forms, this often entailed some creative graphic design, i.e. guessing. The dangers of such guessing became clear when Bill/Lou was Photoshopping some words in the Devanagari script (used for Hindi, Gujarti, Punjabi, Sanskrit and others). Day, who is studying Hindi, noticed some of the diacritical marks common to Devanagari had become distorted enough to in fact create different words, or nonsense. We realized then that, whereas we could confidently adjust the shape of words in the Latin alphabet, we must hew rigidly to the given shapes of all other scripts, and trust to the accuracy of the text as rendered from our internet sources. Then there's the problem of written scripts versus spoken language -- for example, "shakti" (as the word is pronounced in English) is common to a number of South Asian languages. It's apparently pronounced similarly in many, but is written diffently. A similar situation occurs with "salaam" or "shalom". Different tongues write in a variety of beautiful scripts; the same word appears to us in differnt, "arabic-looking" forms . And some languages from oral traditions, such as many North- and South-American Indian tongues, have no written analog, or necessarily standardized spellings. We had to decide on a suitable transliteration using the Latin alphabet. 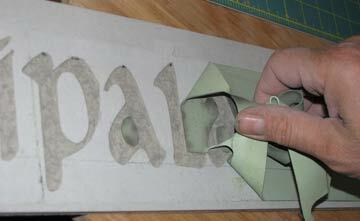 Then we needed to choose a lettering style that would hopefully "feel" correct for that language. In the process we have no doubt incorporated the errors of others and made some of our own -- of spelling, script or appropriateness. In the years to come, we hope that native speakers will point these out and forgive us. 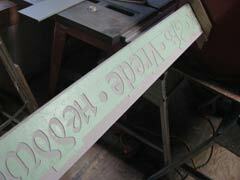 Then we'll need to decide how to carve repairs. Eventually we'll create a handout that lists all of the words we used and their respective languages and countries. Out of all this, our main goal remained: to the extent space allowed, we hoped that every person who might visit the house, from any land on Earth, would be able to to find at least one "peace" in a language that they recognized. We layed out the words with a computer, trying to even out letter height and stroke width for some regularity within this horizontal format. Then we applied spray adhesive to the back of the the inkjet printouts, adhered them to the stencil masking material, and hand-cut each letter. We composed each section of trimboard based on where it would be located on the house; we alternated word lenghts and font styles to achieve a pleasing rhythm. 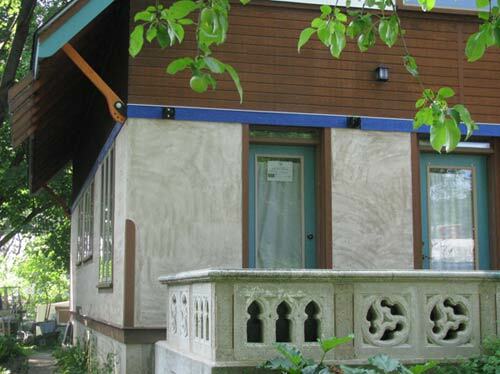 The abrasive (blasted under high air pressure) bounces off the rubbery stencil mask, but cuts away the surface of the hard fiber-cement board (a high-quality house siding material made from wood dust and portland cement). The longer you blast, the deeper the letter. We used a uniform color of house paint; the effect we intended is that the incised words are legible close to the house, but the band appears as normal house trim from the sidewalk. 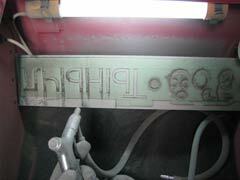 Inexpensive abrasive-blasting cabinet, modified with slots cut into the sides for continuous feed of 12-foot long pieces. 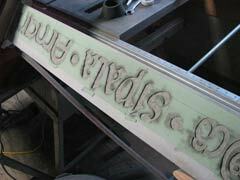 ....and letters emerge carved deep.